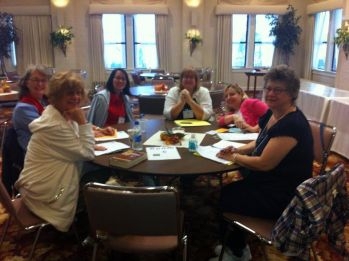 Word Weavers (originally Northland Writers Critique Group) was formed in March 1997 when five writers with a heart for God gathered around a dining room table and expressed their hopes for publication. The five got to work, learned the art of critique, and slowly publication came for them and those who had joined them. Eventually the numbers grew, forcing the group out of the home environment into a larger facility. Carmen Leal, who birthed the group, moved from Central Florida to Naples, and Eva Marie Everson began facilitating. The group officially became Word Weavers. A Steering Committee was formed. Eva Marie served as president. Under her leadership the group began bringing in guest speakers, started hosting book-signing parties and an annual retreat, charging membership dues, dividing into small groups, and giving scholarships to conferences. In 2007, Eva Marie named Larry J. Leech II as the next president. Together they developed the current plan of term limits for members on the newly, and aptly, named Leadership Team. Under Larry’s leadership, the frequency of guest speakers increased, membership numbers reached new heights, six Word Weavers chapters were launched nationally, and the vision for the National Leadership Team was organized. Larry asked Eva Marie Everson and Cheri Cowell to join him. In 2010, Word Weavers became the critique group arm of the Jerry B. Jenkins Christian Writers Guild. During its time with CWG, Word Weavers grew to thirty-one chapters and more than 500 members, many of whom are best-selling, award-winning authors of books, magazine articles, devotionals, etc. Then, in 2012, the Leadership and the Guild realized that Word Weavers best served its members as a not-for-profit organization. Within a few weeks, Word Weavers International, Inc. was established. 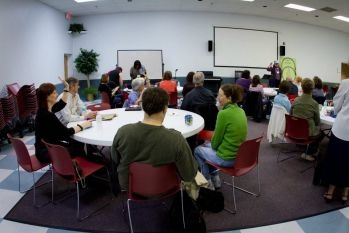 Eva Marie Everson became the new president of the international face-to-face critique group and Mark Hancock, president of Word Weavers Volusia County, became the vice president. Four "mentors" were drawn from the current presidential membership--Carol Barnier, Tim Burns, Andy Lee, Henry McLaughlin--to help oversee and serve the chapter presidents. Currently, we have six mentors, as we have added Taryn Souders and Bruce Brady to the team. In May 2013, Word Weavers International, Inc. launched a trial run using Google+ in order to form online groups, specifically for those who are homebound, or who live in remote areas, which makes forming or getting to a face-to-face chapter impossible. Google+ allows those in "hang-outs" to see one another, which meant we would not lose the "face-to-face" concept we hold to. Groups formed are typically no more than six per group and function as any other Word Weavers chapter. We believe in the Scripture of the Old and New Testaments as inspired by God, and that they are the supreme and final authority in faith and life. We believe that Jesus Christ was begotten by the Holy Spirit and born of the Virgin Mary and is true God and true man. We believe that man was created in the image of God; that he sinned and thereby incurred not only physical death but also that spiritual death which is separation from God; and that all human beings are born with a sinful nature and, in the case of those who reach moral responsibility, become sinners in thought, word and deed. We believe that the Lord Jesus Christ died for our sins according to the Scriptures, as a representative and substitutionary sacrifice, and that all who believe in Him are justified on the ground of His shed blood. We believe in the resurrection of the crucified body of our Lord, His ascension into heaven, and His present life there for us as a High Priest and Advocate. We believe that all who receive by repentance and faith the Lord Jesus Christ are born again by the Holy Spirit, and become children of God. We believe in the spiritual unity of believers in the Lord Jesus Christ.